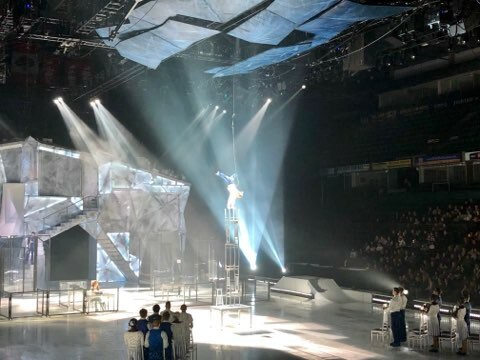 CRYSTAL, the touring show from the Canadian company Cirque du Soleil wrapped up a long weekend of shows (Wednesday through Sunday, with three shows on Saturday) at the Angel of the Winds Arena in Everett. I took a backstage tour of the show a few hours before Wednesday night’s opening, so it was a fascinating contrast of the mundane nature of the backstage environment with the excitement that happens on stage, or on ice, in this case. 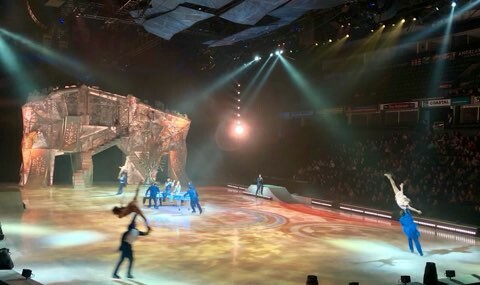 This is Cirque’s forty-second production, and the first to be performed on ice. Crystal’s story surrounds a young girl named Crystal and, to borrow a sentence from Wikipedia, “It is described as a woman shattering reality to discover herself in the world of possibility.” The part of me that loves all things Alice in Wonderland was hooked on this story line, but when I go to see Cirque shows (this is my fourth: Iris, Amaluna, Volta, and now Crystal), I’m less drawn to the plot and more in the audience to watch the acrobatics coalesce around a story, any story. Or at least that’s usually the case, but Nobahar Dadui makes such a compelling Crystal, with incredible grace and athleticism. She has the skill of a figure skater (which she is) and presence of a movie star. Overall, Crystal is much slower-paced than, say, Volta, but there are moments of pure amazement, and when you get drawn into the story, there are some genuinely romantic parts of the story that were impossible for me not to be drawn into. I’ve seen the balancing chair act performed a handful of times, including during Absinthe, my favorite Vegas show (it’s like Cirque du Soleil for dirtbags: it’s amazing), but here, there was a (literal) twist I hadn’t seen before, which is the performer rotating the stack of chairs 90 degrees (give or take) with his hips. It was dazzling to watch, even though I saw it twice: once during rehearsal and as part of the show a few hours later. The athleticism is undeniable, but the stakes-raising makes it unique and makes you unwilling to look elsewhere. The music, while great overall, was slightly discomfiting when I heard a cover of Beyonce’s “Halo.” It wasn’t out of place, and fit with the scene it accentuated, but dropping Beyonce songs in 2019 appears, to me at least, to signify a level of coolness that is often unnecessary. Still, this is a bold and exciting production from a company that you have come to expect a high level of quality. If you hold athleticism, acrobatics, gravity-defying, and storytelling sacred, the way I do, you can scarcely find better ways to spend an evening.